Index funds are a hot commodity these days (no pun intended), but there remains some confusion around what exactly an index fund is, and how it differs from an ETF (exchange traded fund). The confusion is heightened when people first learn about leveraged or commodity ETFs. If you’re going to invest in index funds, we think it would be a good step (maybe not step one, but somewhere at the beginning of your learning) to understand exactly an index fund is. So, What Is An Index Fund? Let’s get a TL;DR (“too long; didn’t read” in internet parlance) out of the way right now – an index fund is a strategy. An ETF is a legal structure. And what defines an index fund? An index fund is any type of fund that invests according to an index. And that means, again, without getting into the weeds, that the fund just tracks an index, and the managers don’t make active investment decisions (making stock picks, bets on market direction, predictions about the economy, and so on). The index itself has a specific definition – in the case of the S&P 500, the 500 biggest companies trading in the US markets based on market capitalization (number of shares outstanding multiplied by price per share). Because indexes are rules-based, you can track one “passively,” and you don’t have to make any decisions. In essence, investing in an S&P 500-tracking fund means you’re saying “I am happy to just get the return of the overall S&P 500, regardless of what that is.” And there’s good reason to do this (look for other posts on the argument for passive investing). So if not all ETFs are index funds, what are the rest? Well, there are lots of ETFs that track commodities, or use debt to add leverage, thereby multiplying both gains and losses. In a strict sense, you could argue that these are also passive – they invest in certain futures contracts according to rules. But when you buy them, you’re generally making a prediction about markets, and you’re not going to receive the same return as the underlying asset or commodity spot price (look for other posts on why you can’t “set and forget” an investment in a commodity or leveraged ETF). There are also fully actively managed ETFs, ones where portfolio managers make stock picks. Canadian fund company Horizons run a bunch of these, for example, the Horizons Active Canadian Dividend ETF, which trades under the ticker $HAL.A on the TSX. $HAL.A is managed on an ongoing basis by professional portfolio managers who pick stocks they think offer the best risk-adjusted return with a dividend. 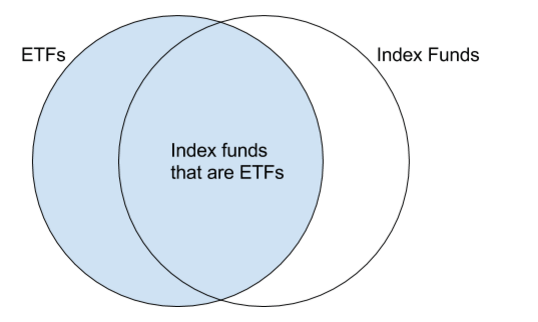 And there are ETFs that sit somewhere in the middle – tracking an index with rules, but in a niche sector where an investor would be hard-pressed to argue they’re not making an active bet on that sector, if they owned the ETF. There’s an ETF in the US with the ticker $JETS – and it specifically invests in the U.S. Global Jets Index (U.S. Global is a fund company, and we would argue that they created this index just so they could build an ETF around it – more on how many indexes there are out there in other articles). If you invest in $JETS, you’re probably betting that the global airline industry will do well. And if not all index funds are ETFs, what are the rest? Well, of course, you can buy an index fund structure as a mutual fund! A mutual fund is a legal structure for a fund. It differs substantially from an ETF because it isn’t publicly traded, and it only gets priced once per day, at the end of trading. If you want to redeem your shares in a mutual fund, you get that day’s price. So what are some examples of index-tracking mutual funds? The big one in Canada is TD e-series – while TD Asset Management runs a ton of active funds, they’ve also reacted to market demand and made index funds available as mutual funds. An example would be $TDB900, or the TD Canadian Index Fund, which tracks the S&P/TSX Composite Total Return Index. In the US, Vanguard runs a bunch of passive mutual funds (they’re not available to Canadian residents). 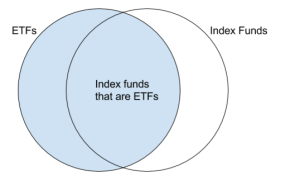 Index funds and ETFs are not one and the same. But they overlap. Not all ETFs are appropriate for novice investors, and some are arguably dangerous for all non-professionals. But most ETFs are more benign. And no matter what, index investing presents a pretty compelling opportunity for an investor focused on maximising long-term returns.